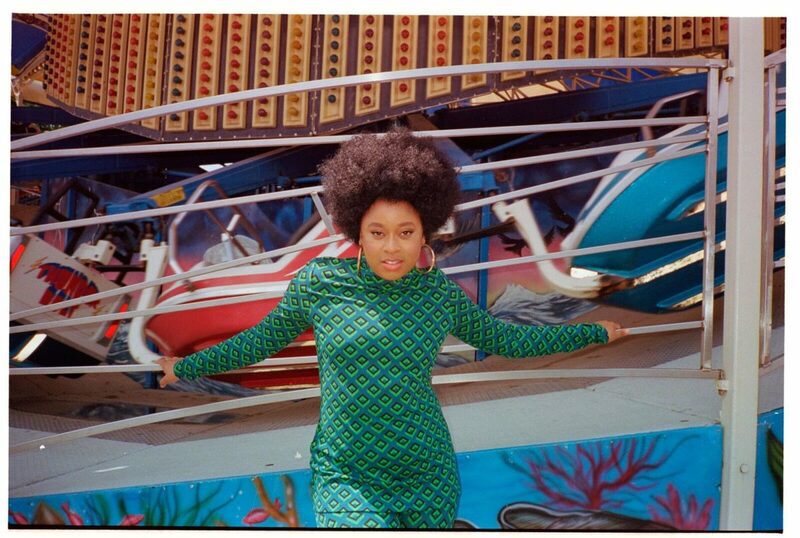 Phoebe Robinson in Coney Island, Brooklyn. 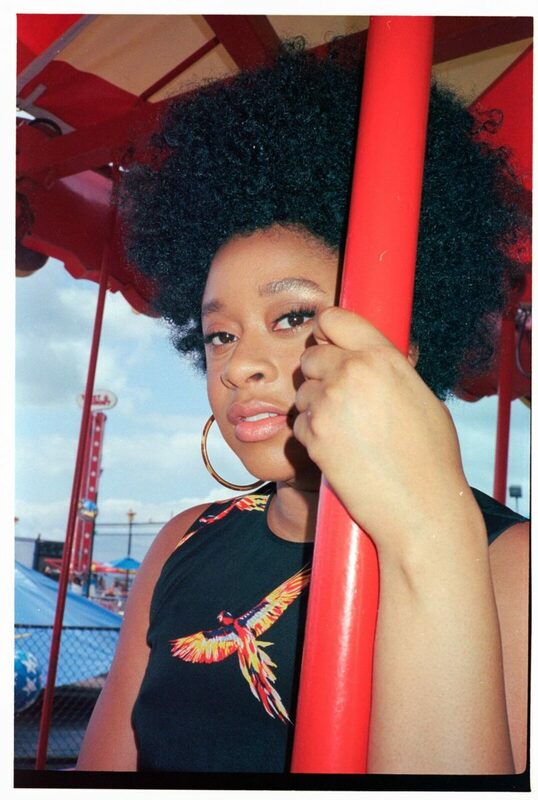 Rising comedy star Phoebe Robinson moved to New York in 2002 and hasn’t stopped chasing what she wants since. Our Issue 6 cover star talks life’s ups-and-downs amid the rumbling roller coasters of Coney Island just before jetting off on tour for her most recent book, Everything’s Trash, But It’s Okay. When I finally sit down with comedienne and author Phoebe Robinson one muggy August day, I feel like the scene could be ripped straight from one of the 34-year-old’s winding and charmingly relatable bits of anecdotal comedy. The co-host of the dazzling podcast 2 Dope Queens of course would tell it better than I—sprinkling in her signature magpie panache of hashtags, neologisms, and “abbrevs” (as in abbreviations)—but I’ll attempt to set the scene. We’re drenched, laughing nervously, and trying to get our bearings at a Coney Island, Brooklyn, bar with some kind of maritime-slash-sports-bar theme that is at odds with itself. This stop marks the end of Robinson’s otherwise glamorous shoot, which had her taking on a haunted house in Diane Von Furstenberg and riding the carousel with none other than 90s heart- throb actor Ethan Hawke (more on that later). New York is not your friend. It’s not interested. Quite literally as Robinson strikes her last pose on the sprawling amusement park’s promenade, the skies open. So we book it—photographer, creative director, stylist, assistants, producer, and Robinson’s loyal glam team—converting the collapsible tent that had functioned as the on set dressing room into a makeshift umbrella. We dash to this bar, where we now sit facing one another, dripping wet, trying to talk shop namely, about Robinson’s new book, Everything’s Trash, But It’s Okay, released in October 2018. She and I can’t get our waitress’s attention, and yet, like any New York comedian worth her salt, Robinson just chuckles and rolls with the punches. After all, the funny lady has lived here for years now. In 2002, Robinson moved to Brooklyn from the Cleveland, Ohio, suburbs to study screenwriting at Pratt. Robinson knows all too well this city suffers no fools—even if your star is on the rise. “Yeah, New York is not your friend. It’s not interested,” Robinson zings. Tell me about it, I think. With the pleats of her magenta Claudia Li skirt blowing in the wind, it takes Robinson little time to acclimate to her whimsical surroundings at Coney Island. “You’re in a different city, and you feel like you have to start over from scratch to make new friends,” Robinson explains of moving to the city. But the struggles of making it New York provided the movie and pop-culture junkie plenty of fodder for her budding stand-up career. Veering away from screenwriting by her mid-twenties, Robinson found her way to the stage, steadily making a name for herself in comedy while holding down day jobs as an executive assistant at New Line Cinema and at the media company IAC. Built in the late nineteenth century, three of Coney Island’s rides are protected as designated New York City landmarks and are listed in the National Register of Historic Places. It was also her blog and podcast, Blaria (as in, the black “Daria,” MTV’s nihilistic but beloved teenage cartoon heroine), which she began in 2012, and her online writing for Glamour that helped Robinson capture an audience. 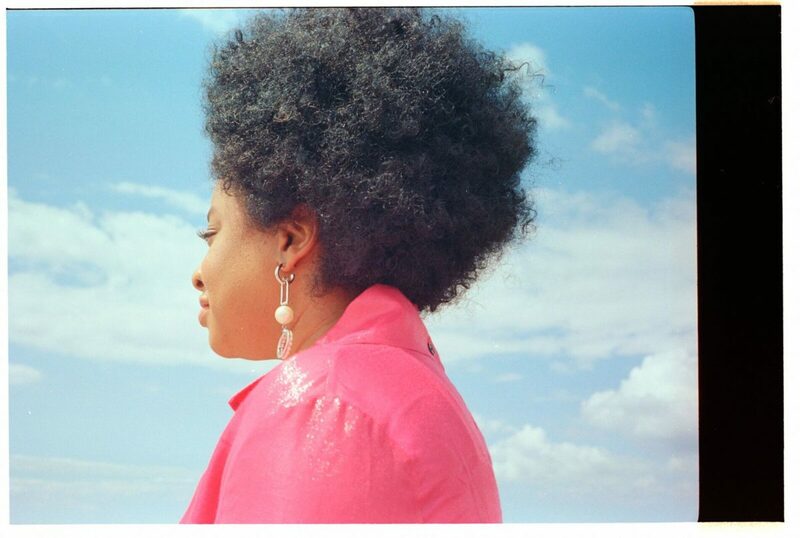 Readers were absorbed by her insightful and quippy takes on pop culture and feminist politics, laying the groundwork for her breakthrough WNYC podcasts, “2 Dope Queens” and “Sooo Many White Guys”—the latter produced by Ilana Glazer of “Broad City”—and the runaway success of her first book, You Can’t Touch My Hair: And Other Things I Still Have to Explain, published in 2016. Emerging at a watershed moment for modern-day black creatives in a pre-Trump era, Robinson’s podcasts and book were entrants into an emerging canon of thought on the intersection of pop culture and race. Think: Beyoncé’s Lemonade, Solange’s A Seat At The Table, Issa Rae’s “Insecure,” Barry Jenkins’s Moonlight, and so on. Public discourse on the politics around touching black women’s hair, or the lack of roles for black performers, was being prioritized. Quickly, You Can’t Touch My Hair sent ripples through the upper echelons of entertainment, charming the likes of Oprah and Bono (two of Robinson’s idols), and morphing the artist into a lodestar for the change afoot in Hollywood and beyond. I’m really hopeful that feminism is going to open itself up more. Robinson’s outspokenness doesn’t stop there. Full of compassion and patience, the performer and proud intersectional feminist also takes on the racial blind spot of the current-day women’s movement, which has left many women of color and queer women frustrated by and skeptical of so-called feminist initiatives. As she details in Everything’s Trash, after the 2017 Women’s March, Robinson was left feeling conflicted about her white sistren in attendance who were otherwise absent from the conversations around the political disenfranchisement of black and brown people. “It was nice to see this rallying cry [behind feminism]…but I think it is much more complex than that. I just wanted to talk about it,” she explains. “I’m really inspired by what I see people doing, whether it’s marching, or writing honest essays and books, or starting groups and having conversations. I’m really hopeful that feminism is going to open itself up more,” she says. For her next publishing endeavor, Robinson wants to create her own book imprint; rather than just being satisfied with her own success, the polymath wants more people of color and queer people in charge of their narratives, and in decision-making positions within the entertainment industry. She’s also working with Bono on Poverty is Sexist, the singer’s new initiative to promote access to education for girls. All this while launching a book tour, writing a pilot, and ramping up for the second installment of the “2 Dope Queens” HBO special, coming in 2019. 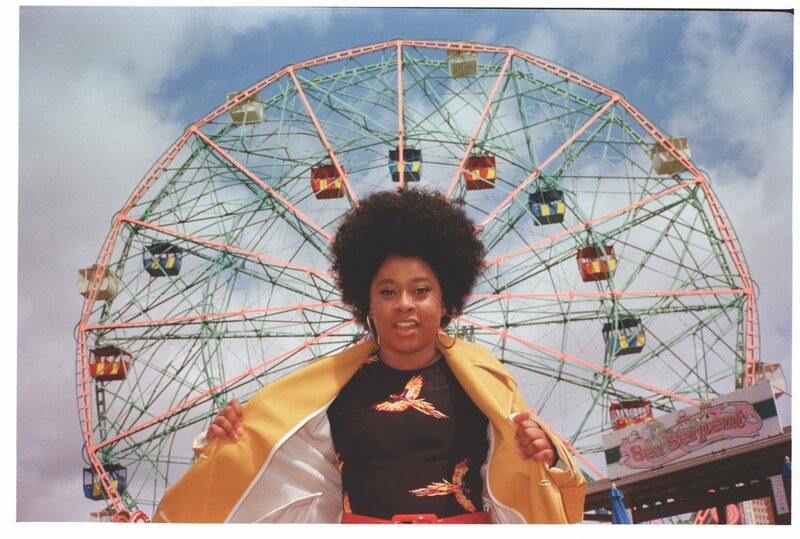 Phoebe Robinson at our Issue 6 cover shoot in Coney Island. If Robinson’s plate seems full, that’s because it is—and she likes it that way. She’s a self-described “workaholic,” who even lamented to me on set that, as fabulous as photo shoots are, they take her away from her passion. When I read Robinson’s accounts of her work ethic in Everything’s Trash, I can’t help but think it’s inextricably linked to the “black tax”—an axiom that argues that black folks in any industry must work harder than their white colleagues to achieve the same goals, all while enduring considerable scrutiny due to race. As a black woman navigating New York comedy clubs and an industry dominated by white, cis men, I imagine Robinson is up against plenty of pushback. But she isn’t quick to agree. “I’m sure there’s some of that,” she says. 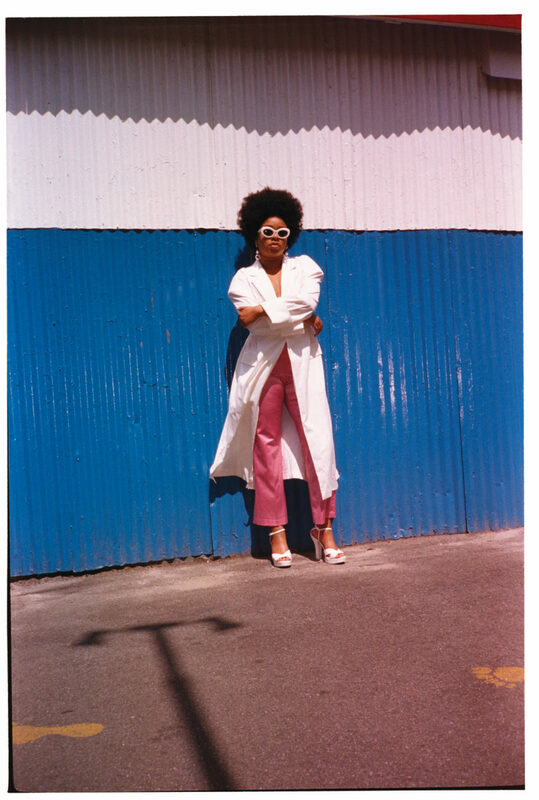 “But if you don’t have a leg up, you just really have to push yourself to get the momentum going.” Without nepotism or familial financial support at the beginning of her career, Robinson simply dug her heels in. If you don’t have a leg up, you just really have to push yourself to get the momentum going. 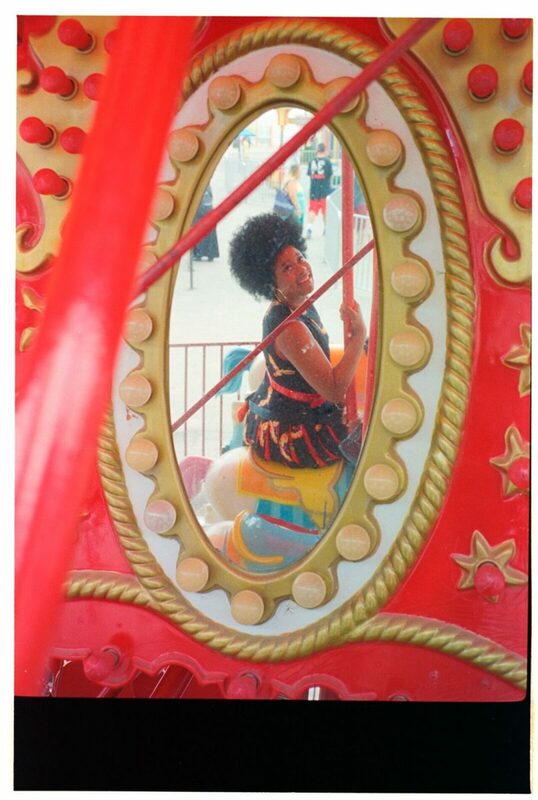 When I receive an email from Robinson the next day, detailing her mid-photo shoot run-in with Ethan Hawke—nay, “Eth Haw,” as she has now affectionately dubbed him—on the Coney Island carousel with his daughters, I think she has some incredible fodder for a third book. In that signature tone of hers, Robinson relays how, in not immediately recognizing the scruffy Reality Bites star, she almost curses him out. He had accidentally cut in front of her in line, triggering Robinson’s growing sensitivity to white men not respecting her in public spaces. Hawke immediately apologizes, charming Robinson in the process. Purchase Phoebe Robinson’s latest book, Everything’s Trash, But It’s Okay, from Penguin Random House here.